These guys really know how to have a good time, no matter what they're doing! I see from other blogs that posting regularly is the norm, though why i should start conforming to the norm now is another question! Anyhow, thought i could post a "short" one without pics to outline what we are up to these days with the house. At the house itself, the stairs to the root cellar are done ~ yippee! For those of you who don't know, the root cellar is under the house, our basement really, with a door right off the kitchen..how convenient is that! 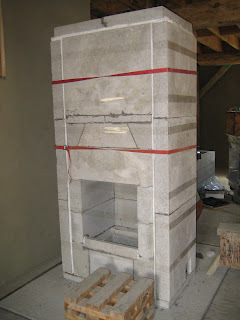 We have bought tile to lay out this week we hope, that will go under and around the Pioneer Maid cook stove, around the chimney and masonry heater. We bought beautiful and not too expensive slate tiles, and hope they don't chip themselves away to bareness...hmm. The kitchen cabinets get some attention when there's a break in the other projects. Meanwhile outside, the WWOOFers and I are busy weeding, watering and mulching all the babies we have planted this year and in years past: apricots from the compost pile, yellow currants, Choke cherries and Nanking cherries, Poplar (Okanese), Lilacs, and Mock Orange, all planted pretty close together to act as a living fence and windbreak....with some luck, the deer won't eat them all, and yes they do eat everything at least once to try it out. The Lilacs are well ahead of the others - go for it! I also gave in at a market and bought a Linden tree, supposedly good luck or good Karma or some such...love them...so do the deer! Next: mixing and painting the interior walls and masonry heater, first doing some decorative tiling on the heater with Mexican tiles...pretty. Tiling the bathroom shower and bath and sink areas, tiling the kitchen sink area and window sill above it. Finishing wiring, starting on interior plumbing. The ceiling will get insulated and covered hoping with nice birch plywood. Then the wood floor, using sustainably harvested, tongue and groove Fir from Vancouver Island. Doors for the pantry and root cellar too, cabinets and sink installation in the apothecary, front hall closet door and finishing, and the list goes on....sigh! The emphasis is on finishing the first floor so we can move in and finish the second floor during the winter, sleeping in our moveable cabin if need be. 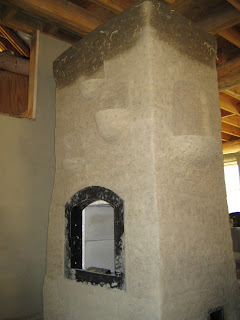 Our 2nd Earth Plaster workshop was a total success! This was actually our very first workshop on our own, meaning we took the plunge, and with the blessing of the Mud Girls, did this one on our own. Hats off to the Mud Girls for showing us how it's done ~ we are forever grateful to you! Their workshops are HIGHLY recommended by the way (visit www.mudgirls.ca). We had the pleasure of hosting 10 wonderful people from as far away as Egypt (ok, via Montreal), and from as close as Lillooet, who took time out of their busy lives to come help us plaster the interior walls (on lath), plus our cob masonry heater and cement block chimney, as well as apply natural paint on the outside of our home. 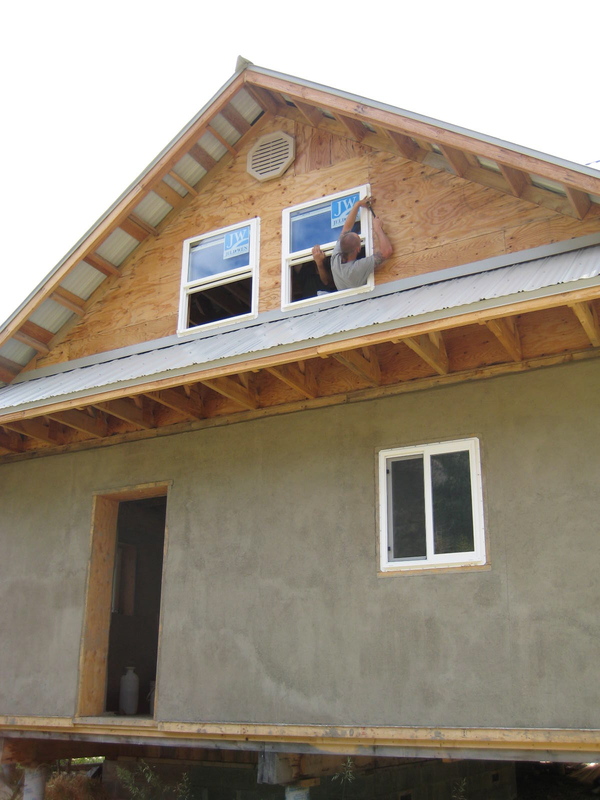 The crew learned from scratch and mastered the art of earth plastering within days. Karim, Hanaa, Coral, Joni, Jose, Glenda, Nelson, Lauriel, Mark and Diane...we thank you again for your help, enthusiasm, sense of adventure and love of all things mud! The weather tried to challenge us, but nonetheless, we carried on and got tons done on the house. The food was divine and plentiful, once again, huge thanks to Stepha and Anna. Thanks to Devora, also once again, the kids were so well cared for and they had a blast! Thanks also to Roy and Travis for being the behind the scenes people. And to Camilche and Osha for coming in towards the end to lend a hand. Thanks everybody... mi casa es su casa. Though it was only 4 days together, we all left the workshop feeling like family, or like it was the last day of camp ~ we lived and learned and ate and worked and sang and danced and talked and got down in the mud together, and got along extremely well to boot! The feedback during our closing circle was overwhelmingly positive. 'Twas a beautiful and fun time for sure. These photos can only convey a hint of the experience - but, like chocolate, one has to try it to really know what it's like...there will be more workshops, keep your eyes peeled and let us know if you'd like to be on the list! Herbalist, gardener, local activist Gillian Smith, and builder/poet Jonathan, with their young son, Jamie, are a small family living in a long-standing, close-knit community of alternatively minded folks in the mountains of BC's Southern Interior (St'at'imc Territory). We are committed to the preservation and propagation of skills, arts and life-ways that provide a respectful and harmonious means of relating to this Earth that is the source of everything we are. Jonathan will be your fearless leader, and we will endeavor to all work as a team in a cooperative, supportive and fun filled way. For more information about the workshop, or to register, please contact Gillian by email : info@gilliansherbs.com, and check out our blog : www.vastmountain.ca for photos and more information about our place. Registration is limited - please register by May 15th. If you can't make it in June, we hope to have another workshop in August. 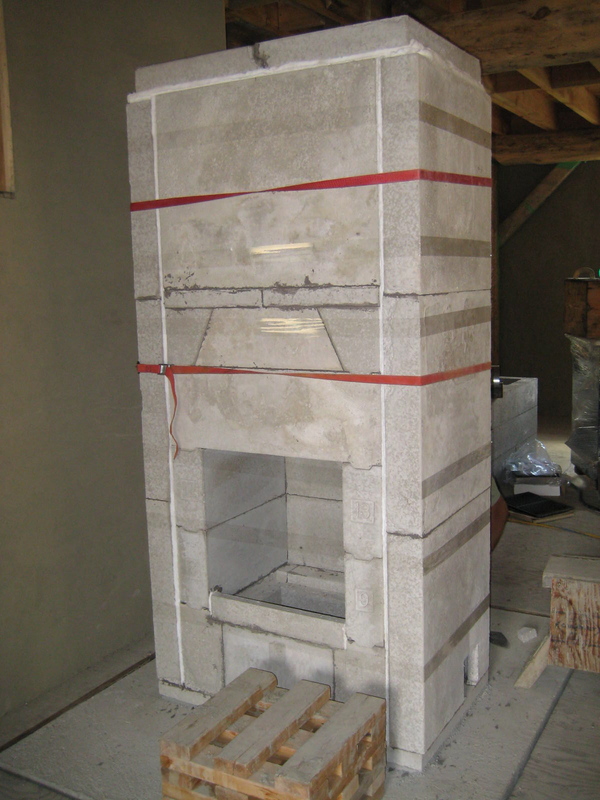 The Masonry Heater ~ our hearth centre, our main source of heat. The idea is that small, hot fires warm up the immense thermal mass, which then becomes the source of heat, as opposed to feeding a woodstove all...day...long, knowing that most of the heat is going out the chimney. 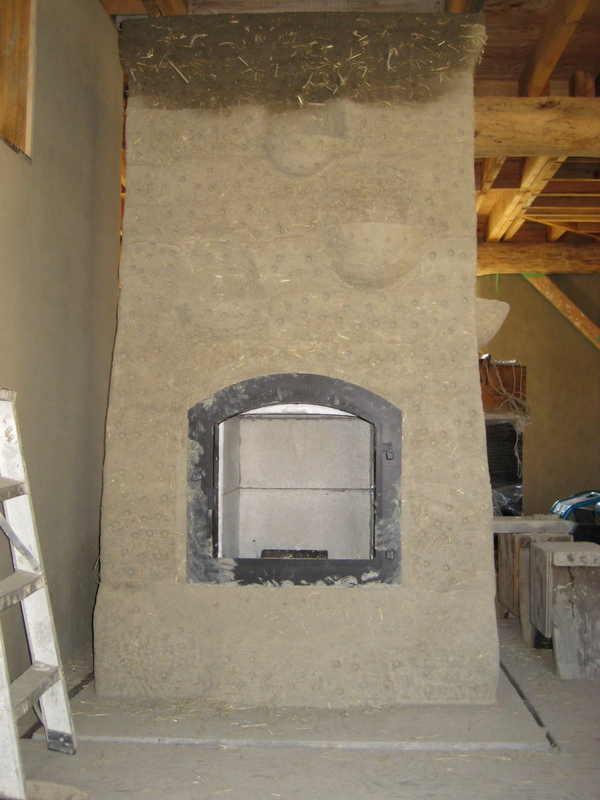 Normally, people face their masonry heaters with brick or stone, but, having become enamoured of clay, sand and straw, we opted for cob, instead. (Plus, we had a big pile o clay sitting outside!). We made bricks and one by one, built it up, and around. Here, you can see them being laid over and on cardboard, which is used as an air "layer" between the bricks and the cob. 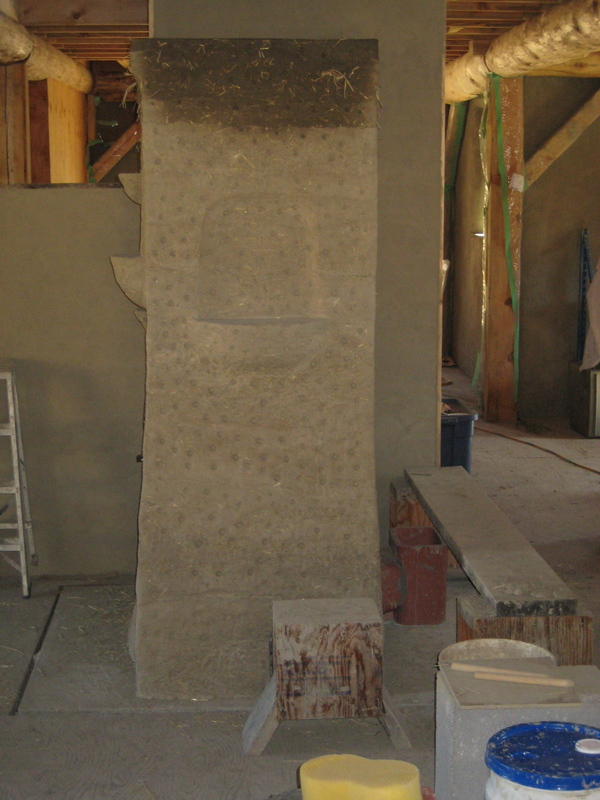 In July 2011, we had the rest of the plastering done, via workbee and Swamp and Travis mostly working on the gaps...see previous post "Mid Summer Workbee". In my humble opinion, the word Workbee should be a common household word. I want everyone to know this word, and better still, i would love it if everyone knew it because they had participated in one (or more), either at someone's home or their own, or perhaps pulling invasive weeds in a nearby beloved park or wild place. A workbee is where people, probably friends and neighbours, sometimes strangers who are passing through, come together and help on a project, because we all know, more hands make short work....and, they are super fun! No money is exchanges, payment is in good karma, some sweat, learning, and if you're lucky, great food.